Joel LaRue Smith’s music is a rich blend of Jazz and Afro Caribbean dance rhythms and harmonies. His songs and compositions, often combine infectious Cuban dance forms such as timba, mambo, songo, mozambique, cha-cha and rhumba with compelling bebop, hard bop and swing melody lines. This music will ignite the passion for anyone to dance, and give each listener great melodies to sing and remember. Joel Larue Smith is one of those rare pianists who has the ability to play proficiently in almost any musical scenario. Blessed with the most extraordinary technique, he is able to deploy this singular ability to Jazz, improvised music, classical music and quite breathtakingly to Latin Jazz as well, and he is extremely good in each style. Significantly, however, both his recordings — “September’s Child” (2008) and now “The Motorman’s Son” — lean heavily, if not entirely, towards the Latin Jazz idiom. No matter in what realm he decides to reside, however, his pianism is breathtaking...Joel LaRue’s sinewy sonority and fiery accents bode well for a highly charged set. The music spontaneously combusts very early in the proceedings; from “The Seed”, the very first track as a matter of fact. Playing with vibrant ‘tumbao’, LaRue Smith showcases both the lyrical and ecstatic aspects of his writing and his playing. The relentlessly forward momentum of the music proceeds from here. A bold interpretation of “Manteca” comes next. The performance of a song, so integral to Latin Jazz, can be a challenge to a lesser musician, but Joel LaRue Smith, who once sat comfortably in the ensembles of Mario Bauzá, turns it into a rhythmic passacaglia with wonderful contributions from Wilson “Chembo” Corniel on tumbadora, Tiago Michelin on drums and Flavio Lira on bass. LaRue’s guaguancó, “The Reverence” that follows further suggests that what is to follow has the makings of a masterpiece. Throughout it all Joel LaRue Smith is explosively colourful in both his pianism and his orchestrations. His soli are dramatic, tensile and emotional. His clean articulation always makes for refreshing, piquant and poetic lines and his phrasing is uniquely accented and rhythmically explosive. Despite covering a wide range in time and place — from “Manteca” to “Nefertiti” – the overriding sensibility here is palpably Afro-Cuban. Meanwhile Joel LaRue Smith succeeds neither by conserving nor jettisoning his African-American background but rather by emphasizing the elements that resonate best around him. The Motormans Son”, at its core, is an exploration of the Afro-Latin diaspora. It finds Smith mixing the music and rhythms of Puerto Rico, Cuba, and the Dominican Republic into a savory Latin jazz dish. The originals, making up the bulk of the program, present with rhythmic zest, twists in time, tight riffs, bold colors, and variable intensity; the choice in covers—an in-the-correct-tradition take on Dizzy Gillespie’s “Manteca” enlivened by some wonderfully raunchy trombone work and an arrangement of Wayne Shorter’s “Nefertiti” that wouldn’t have felt out of place on Conrad Herwig’s The Latin Side Of Wayne Shorter (Half Note, 2008) prove equally inspired and completely in line with the vision for this project. Stepping out royally here on this this mash up of modern jazz, Afro Cuban jazz and underpinnings of funk, Smith knows what it’s all about in giving up and out a joyful noise. Never less than snazzy and pizzazzy, this is how to turn it up when you are turning it out. A real party on a platter, if this doesn’t liven up your barbeque this summer, you better head to the emergency room. Hot stuff that brings the caliente throughout. By creatively shifting time, tone, and tenor, landing finally with a Latin elasticity and rhythmic tide “The Seed,” pianist Joel LaRue Smith’s bold first track from The Motorman’s Son, powerfully penetrates the crowded headspace and airwaves we seem to occupy more and more of late, blowing away the noise with a fresh, new gust. His father was a NYC subway motorman, so you’re going to hear fiery big horns and tight, free-flowing arrangements on this train. Even if you’re getting off at the next station, imagine the lives and the worlds you’ve encountered in that amount of time. LaRue Smith not only imagines it, he shapes and defines it energetically, seemingly at will. There’s no wrong station on LaRue Smith’s line, so the title track, the contemplative “The Promise” and a vivid take on Dizzy’s “Manteca” keep this train rolling. 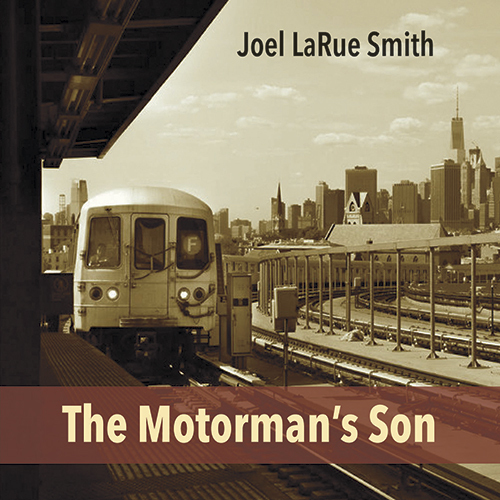 “The Motorman’s Son,” is the new recording of the American pianist Joel Larue Smith, a sonic feast with great collaborations that will delight the most rigorous Latin-Jazz melody players. Smith is seen as a connector, a catalyst of different sound aspects, this time, as he had done in his previous album, “September’s Child” (2008), he bridges between Puerto Rican, Cuban and Dominican rhythms with a jazz amalgam. This educator, whose parents left New Orleans to settle in the northern United States in the 1940s, has a foothold in classical music and another in jazz. He dedicates this project to his father, a public subway driver in New York. “The Seed” begins the musical journey in a convincing way, single solos by Carlos Averhoff Jr (salxofon tenor), Joel LaRue Smith (piano) and Tiago Michelin (drums) adorn this piece that contains an explosive montuno in the second part. The peculiar reading of the classic Manteca (Dizzy Gillespie) emphasizes the Cuban Carlos Averhoff Jr in the trombone and Charles Langford in the alto saxofon. “Reverence,” on the other hand, lowers the fumes to the previous frantic pace with an intimate ballad time. Raices is a marked latin-jazz with dry cuts featuring the conglomerate Wilson “Chembo” Corniel and the saxophonist (high) Charles Langford. The Alternate Route handles an important tension that leads to a cheerful and cadenful meringue. “The Promise” is another solo concert by Larue while Nefertiti is his own reading of the Wayne Shorter classic — recorded by Miles Davis. A real treat with the whole ensemble splurging taste. “Without Fear,” a rather striking name, re-close the circle that opened “The Seed,” a well round and impeccable mastery. Musica de autor, not in vain is an independent production of this composer and arranger.